The second round of the Hobie / ABT Kayak Tournament series was recently held under a blanket of tumultuous weather and resounding endorsement. The Sunshine Coast of Mooloolabah tempted many entrants to continue their efforts from round one and also brought a new flock of participants far and wide into the Tournament fold. Checking in at my hotel on Saturday afternoon I sat on the balcony and scoped the area from a higher vantage point, I was pleasantly surprised to see over 12 kayak angler’s fishing the tournament vicinity. 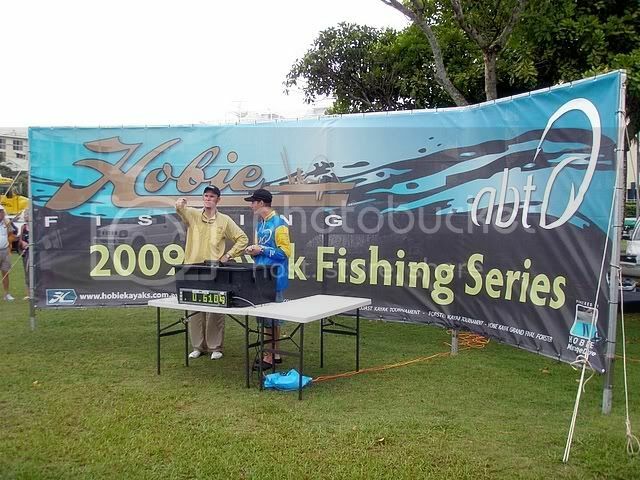 The success of the previous Sydney round made the path so much easier for many, given that this time the event was being held on a Sunday also allowed many to travel and pre fish the area, passing on juicy titbits of information to others. The ABT ‘Who shares wins’ policy was broadcast in full effect with techniques, tackle and sweet spots disclosed openly. From all reports the fishing was hard going and the torrential rain of weeks gone by had taken its toll, many if not all the surrounding rivers in the area were turned to a coffee cup brown. Still the bream were there and responding well to various presentations, the tournament day would be competitive to say the least. 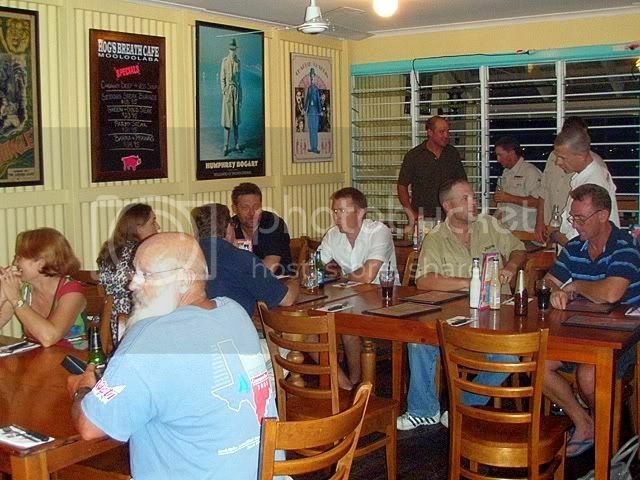 An evening gathering heralded the dawning of the first Queensland event at the local Hogs Breath Café. Steve from Hobie was more than generous (True to form), picking up the tab for all and helping sign off an early night for some well deserved shuteye. Early Sunday morning saw light rain and variant fouling wind easing off perfectly before our shotgun start, 39 entrants lined the start with ammunition and information at hand. The field split amicably almost immediately (A sight worth noting) with two plain courses obviously decided beforehand. Thoughtful game plans became evident with marinas, boats and moored boats harbouring (Pun intended) just over half the field while sand flats, rising tide and mangroves beckoned the remains. My game plan was to head straight for the tidal flats just under two kilometres away, under and beyond the path of the Sunshine Motorway Bridge. It was a bold move that I hoped would pay off early, passing positive pontoon structure to fish surface lures amongst the edges of the mangrove lined banks. To help calm the nerves I prefer to fish the early hours of these tournaments with confidence gained from my local surrounds, overcast conditions indicated the top water was right but with so many foreign species available could I manage to entice the Bream to come out and play? Watching Prawns scatter for their life the confidence mentioned above was tied and tried on early, a Storm Hopper Popper has proven deadly on large Bream down south and immediately brought some sort of result. I provoked a few boils and some short striking, it was a frustrating affair with my chosen location erupting like wildfire for a minute and then switching off for ten or so. Glancing around to share the news I realised I was mostly alone with others being distracted early by the bridges many pylons and back eddies. Spending the next hour or so switching between the Hopper Popper and the popular Ecogear PX45 (Hops vs. walk the dog retrieves) brought little result, as did the application of any waxy scenting to the buoyancy of the top water tackle. By creating a slightly subsurface presentation with the PX45 I finally perplexed my first fish for the tournament, unfortunately netting a new species / personal best that failed to gain any positive acknowledgement from my camera (32cm Spotted Grunter Bream). My structured venture was falling apart at the seems, spying a small band of competitors approaching I ventured back to try the bridge precent, leaving an equally frustrated Ken Raley and Josh Holmes to take my previous drift over the flats. Something rather large was terrifying schools of baitfish under the bridges girth, as I highly doubted any schools or lonely Bream would remain around such danger I unravelled the plan some more. A few small lanes of avenue existed back in mangrove country, one in particular forming a cul-de-sac teaming with fish. In an enclosed arena such as this I had to choose wisely, not wanting to suspend presentation a few natural coloured Ecogear SX40’s were cranked slowly over obstacles. It was at this stage I met (Apart from swarms of Mosquito midge) what I can only assume was another new species, the mighty Mangrove Jack. A mistaken tell tale Bream bump goaded striking early, hooking what I can only describe as one hell of an unstoppable fish. The bruising happened in sequential casts, both which resulted in lost lures and some puzzling yet joyous head scratching. I had been reliably informed the chances of tangling with both Jack’s and Golden Trevally were quite high, whilst not the target species my expensive lost offerings and still born education brought a wry smile to my weather worn lips… My mind wandered off for a few moments but returned eventually, who would have thought getting bricked would be so much fun! The novelty quickly wore off when I finally realised the lure cost and tournament time remaining, the tide along with the ever increasing wind began to reverse any slack line which made surface presentations difficult. With nill result fishing my favourable technique I made the decision to regroup with the moorings and fish various plastics under the bearded drums and vertical shaping’s. The balance of the perfect jig head weight was refined down to 1/32oz, variously rigged on 3” Gulp Shrimp and 4” Gulp Turtleback Worm (.Banana and Pumpkinseed respectively). Using an Outback enabled me to control my drift a little better and get right in close; however pitching offerings amongst this structure became a hazardous affair. After many leader changes and lost jigs I finally hooked up solid, unfortunately to another Grunter Bream. 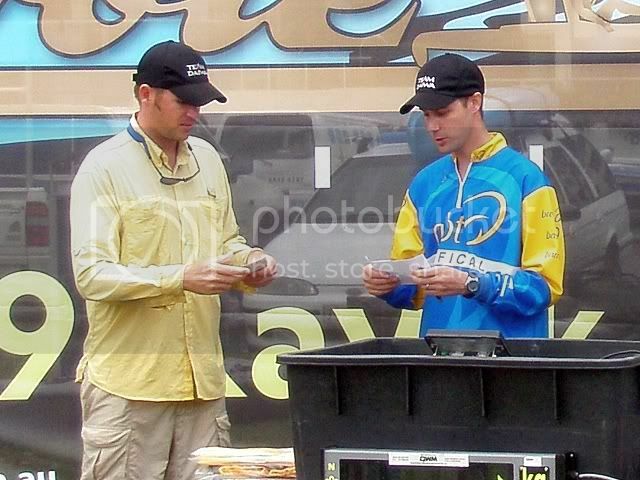 Whilst floating my way down towards the ABT arena I bumped into Wayne Robinson who had still not secured a legal fish. This lead me to believe the tournaments fish count would be low enough to still be in with a good chance. The viewing locals joined us on their jetties, pointing out pipes and holes they knew held bream. For deeper activities I switched to blades, hopping them around closer to the bottom and up and through the water column. At one stage I was connected to an unknown fish that took the lure on the drop, not sure what species it was (I was hoping Bream). Dropping fish was really starting to hurt but unlike the first half of the morning I found the action started to pick up a couple of hours after the high tide mark. With 15 minutes to go I found myself dead in the water, held together only by the enjoyment of the tournament, the social aspects and the end of a tough days fishing. Beaching the Outback I emptied the live well of its invisible holdings and placed my key tag on the board. The vast majority struggled in the conditions; a few Bream were caught here or there with some entrants even managing their two fish limit. 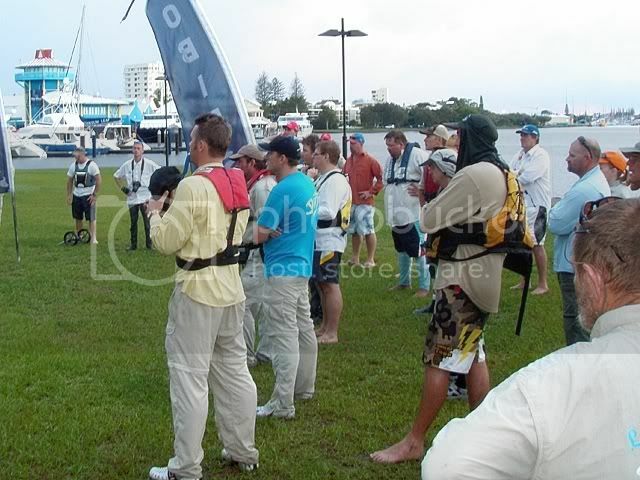 The weigh in was still as lively as ever and considering the weather gods were against us the first of the Queensland ABT / Hobie Tournaments was a resounding success. Tournament results were weighed down to only seventh place out of a possible 39, with 32 anglers failing to weigh in fish (Some even incurring dreaded late penalty points). Richard Creighton’s 0.26kg weight rounded out the points with a hard earned seventh place. 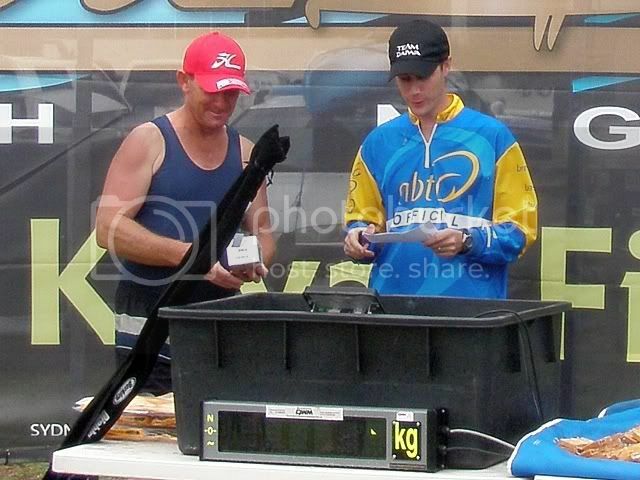 Wayne Robinson scored a single Bream weight of 0.42kg, taking out sixth and keeping him in the hunt for the AOY title. 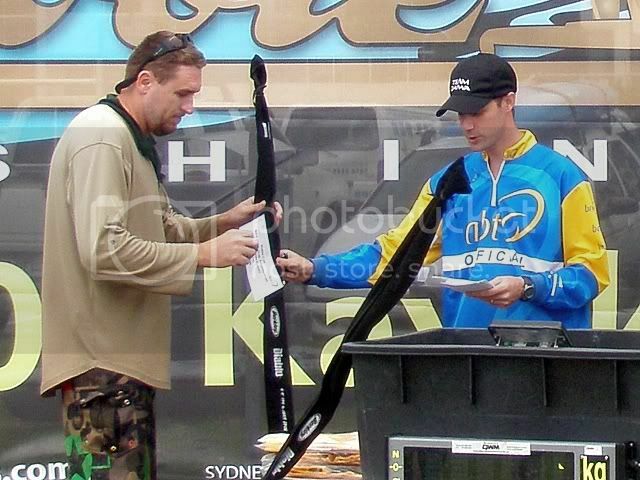 Kevin Crawford‘s fifth place secured the first of the cash pool payouts, $90 and a Berkley Diablo rod. 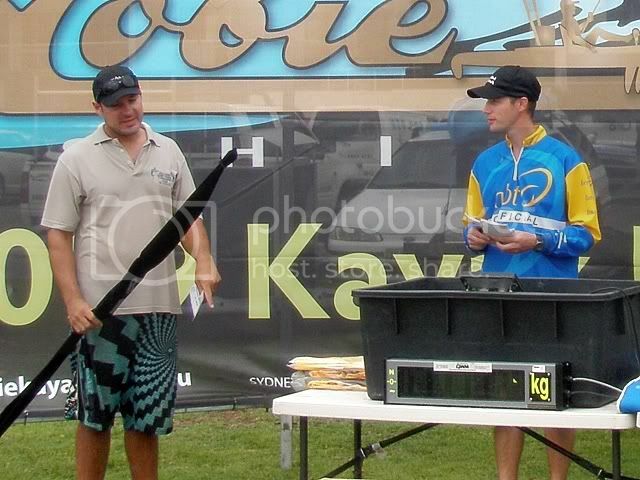 The last of the singular submissions was also the biggest for the tournament; Chris Martin’s 0.61kg fourth place earned him not only a $100 Big Bream bonus but also $90 and a Berkley Diablo rod. 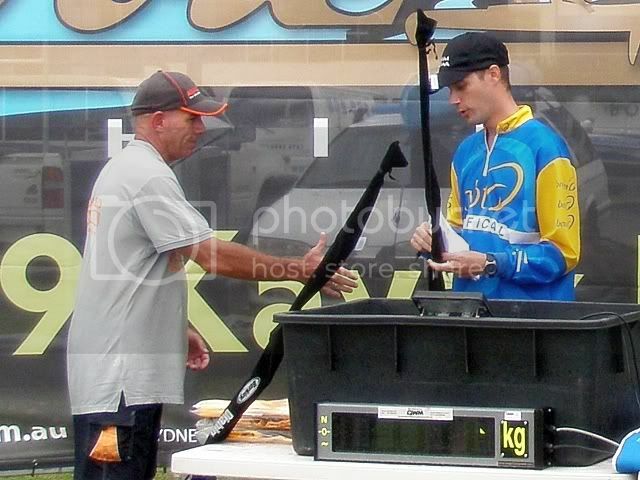 Greg Lewis had travelled a long way to fish this competition; his 0.655kg two fish third place sent him directly into the Forster grand final, $130 and a Berkley Diablo Rod richer plus a little closer to his home on the NSW South Coast. 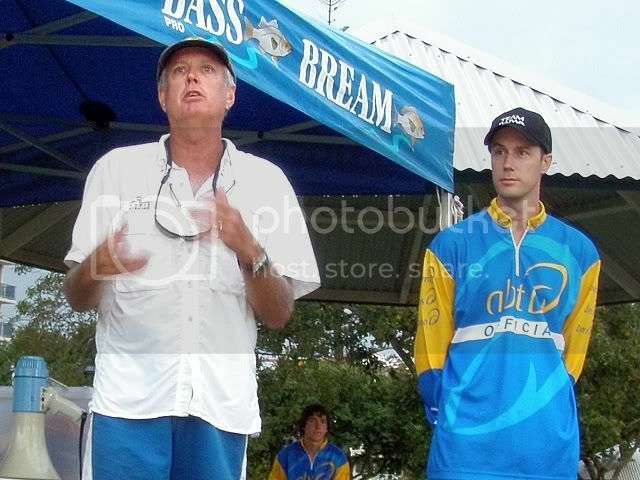 I was excited to see Steve Fields from Hobiecat fishing the event, showing that with true determination the ‘Who shares wins’ policy of the ABT can shine through, even on the bleakest of days. Steve’s tournament tackle involved the use of 4lb Nitlon fluorocarbon fished straight through on a Daiwa Advantage 3 rod and reel combo. 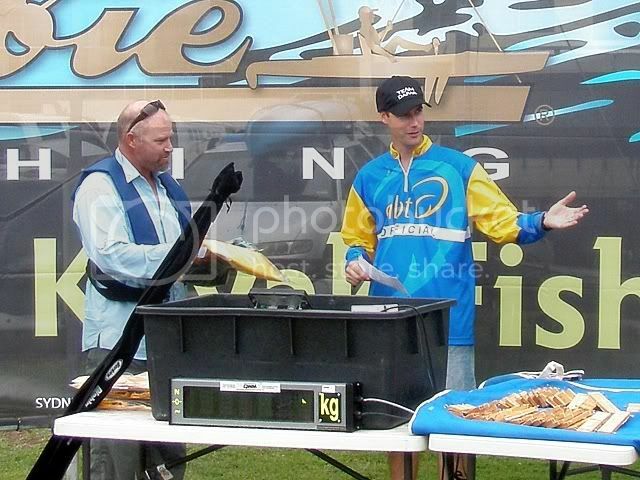 A combined two fish weight of 0.78kg was easily enough for second place; Steve pocketed $220 for his troubles and a fair slice of the ‘Bragging rights’ pie. 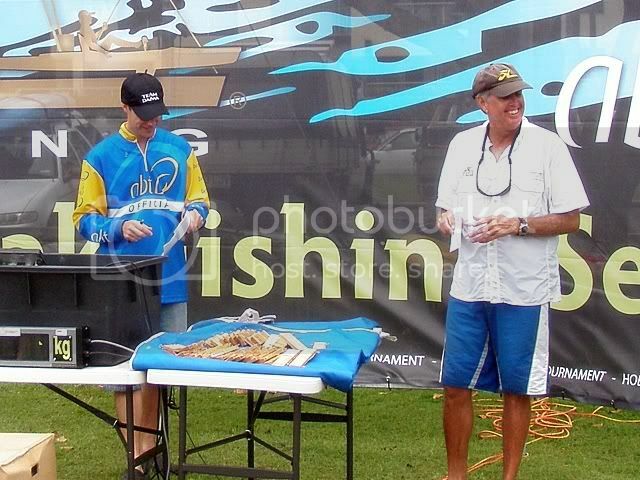 First place went to Josh Carpenter, no stranger to ABT events and an obviously gifted angler. Josh joked about borrowing his mothers Hobie for the event, putting it to good use in the marina surrounding the Tuna Boats and the cleaner canals. 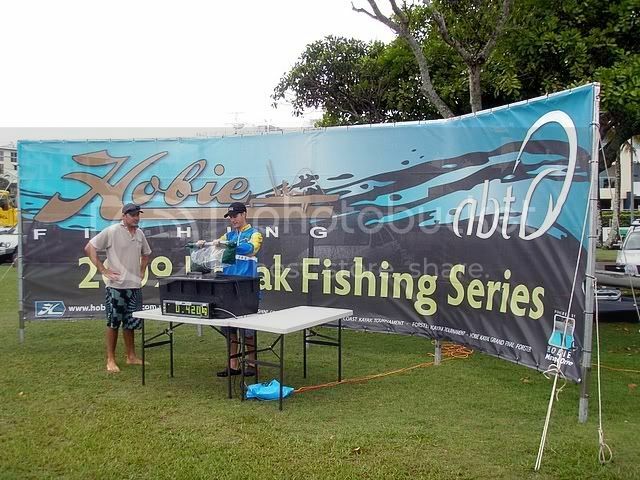 The stealthy approach of a kayak and the audible Bream feeding frenzy helped him secure a two fish 0.98kg limit early, building enough confidence to head to the weigh in early and wait for the $350 to be paid out… A smart move that ultimately won him the event!